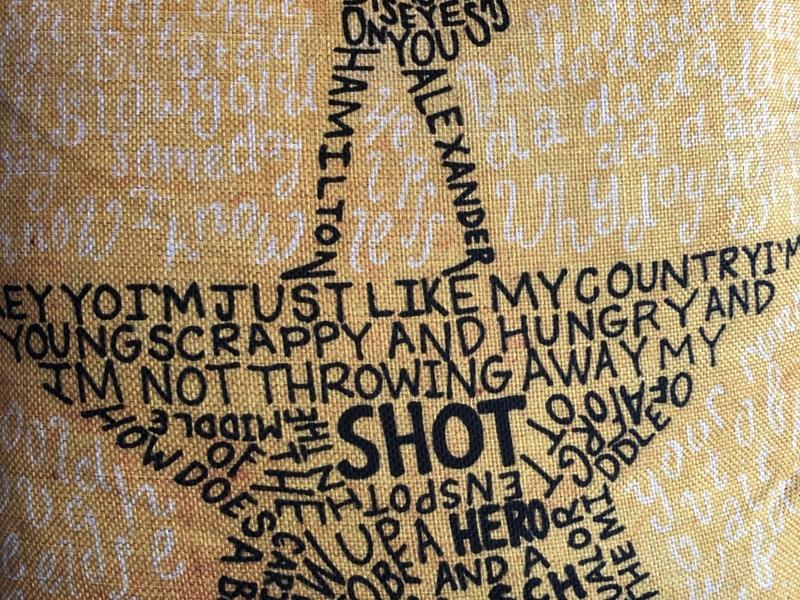 January Report Card: Collin gave me this “Hamilton” pillow. I love it! It reminds me daily ‘not to throw away my shot.’ This is an inspiring mantra especially during a month anchored in a government shut-down and ending with a Chicago shut-in. This past week, temperatures of -25 coupled with -47 wind chill crippled ‘business as usual’ in the second city. Serving = 8 shifts! Ouch! That’s almost 1/2 the shifts from last month and a huge drop compared to patio season. Every restaurant in Chicago is experiencing the post-holiday blues. Reservations are down so shifts get cut. It happens every year. Still, it’s jarring. Because I’m blessed to have some savings to live on, I’ve given up a few shifts to my Wood family trying to make rent. Tommy, one of my Woodies, creatively used the slow month to learn to make candles. I was gifted with one of his coconut-lime creations. My house smelled like a delicious pina colada. It was snowing on the outside but inside it smelled like a day at the beach. Job Search = 24 applications! I applied for a record number of jobs. I continue to broaden my thoughts on what my next adventure could be. I know I want to believe in the work and be challenged by the work. I also want the job to support my current financial needs while contributing to my retirement. I’m being choosy which makes for a longer process. I have toyed with throwing my hat into the Presidential race. Following the “Kamala Harris For The People” announcement on MLK, I’ve considered rolling out my slogan “Katy Walsh Lots to Love” on Valentine’s Day. After all, I don’t want to throw away my shot. Workout with Josh = 10 times! I came off the holidays ready to focus on my strength-training and general fitness program. Josh continues to help get my knees in better shape. He even told me I have ‘runners’ knees’. I thought it was a compliment about my athletic attitude until he told me it meant I had arthritis. Despite that prognosis, I am grateful for my resilient body. I practice icing, salty soaks and movement to nudge it forward in service to me. Yoga = Daily Practice! I continue to do a 20-30 minute mediation practice daily. It helps me maintain a level of serenity facing uncertainty. I also took three yoga classes, one in studio and one at-home. Yoga is a February focus. I have access to my mom’s car and can easily drive to class. I’m going to get in 2 classes/week. Yoga is so good to stretch out my body in these cold and rigid days. *2 online classes! I’m taking advantage of time and the LinkedIn premium package. This month, I took courses on emotional intelligence and brand management. *5 documentaries! I watched a variety of interesting documentaries. “Bar Talk” gave a history of cocktails and has me craving a Hemingway daiquiri. “Panic” gave me an overview of the 2008 economic crisis. “Everything in Copy” was the biography of writer Nora Ephron. “Fourth Estate” was a 4 episode series where the New York Times documents the first year of the Trump presidency. “Life is a Banquet” is the biopic on actress Rosalind Russell. *3 books! I completed two and half books and started another one. I finished My Dearest Hamilton by Stephanie Dray and Laura Kamole. This historic novel about Eliza Schuyler Hamilton was amazing! Eliza is best known for being Alexander Hamilton’s wife but she was so much more. She was a mother of eight, patriot, nurse, founder of an orphanage, fundraiser for widows of the revolution and the Washington monument. At 80, she wanted to see more of the country and traveled to the unsettled wilderness of Wisconsin. She worked with a biographer to tell her husband’s story and ensured his place in history as a founding father. She lived a remarkable 97 years. I listened to the famous How to Win Friends and Influence People by Dale Carnegie. The book was published in 1936 and yet is so prevalent. I intend to write a LinkedIN article reviewing his timeless principles. Despite the bulk of his musings still being relevant to contemporary times, some of his old-fashioned references made me giggle. He highlighted President Calvin Coolidge’s compliment to his secretary’s blouse that secured her admiration. He recommended starting a conversation by asking about a person’s ‘wife and children’ or ‘what lodge he belonged to.’ He emphasized the importance of sending letters and telegrams to build relationships. Although these ideas are charmingly old-fashion, his bigger concepts resonate with living my best life. I also listened to The Book of Awesome by Neil Pasricha. This book is a perfect winter escape. It’s a collection of small things that are truly awesome. It reminds readers to embrace the extraordinariness of ordinary moments: several green lights in a row, putting on clothes out of the dryer, picking the fast line at the grocery store, finding a forgotten $5 bill in a pocket. Pasricha gives gratitude for a happy-go-lucky life. His list made me smile remembering about trick or treating strategies and waking up to realize it’s the weekend. On Audible, several narrators add multiple personality to the entertainment. It is …. AWESOME! I’m 1/2 way through another historic novel by Stephanie Dray and Laura Kamole, America’s First Daughter. It chronicles Martha ‘Patsy’ Jefferson’s life. As she died, Patsy’s mother made her promise to take care of her father. Patsy was 8. And Thomas Jefferson was suicidally depressed. I’m up to Patsy being 18 in France and still serving as surrogate spouse to her father who sounds emotionally manipulative. I started not liking Thomas Jefferson in Eliza’s book and it continues in Patsy’s book. Eliza believed TJ put himself before the country’s best interest. Reading this new book, I believe he put his own welfare before country and his own children. Although I’m fairly disenchanted with the author of the Declaration of Independence, I am enjoying learning about the life of an American ambassador’s daughter in France during the brink of the French revolution. Theatre Reviews = 8 reviews! I saw and reviewed “The Lightning Thief” (Broadway in Chicago), “Saint Nicholas” (Goodman Theatre), “Noises Off” (Windy City Playhouse), “Ajijaak on Turtle Island” and “Compagnie Non Nova’s L’Apre’s – Midi D’Un Foehn Version 1” (Chicago International Puppet Festival),“Us/Them” (Chicago Shakes), “Southern Gothic” (Windy City Playhouse), and “How to Catch Creation” (Goodman Theatre). Playing = YES! Although I’ve been homebound since Tuesday afternoon and in my pajamas for the bulk of the polar vortex, I did get out and have fun in January. I went to Indiana twice. At the beginning of the month, I went for a couple days to hang out with the parents before their Caribbean cruise departure. I got in lunch with Mary in South Bend. 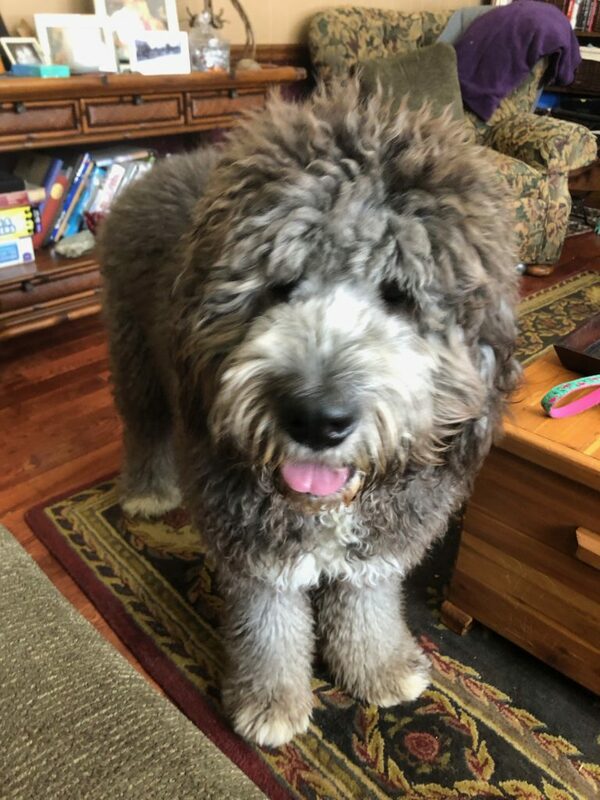 In the middle of the month, I went for a 24-hour quickie and had drinks with sisters Christy and Jenny, played with Dolly and even saw nephew Matthew briefly. I also had a house guest. Sue James came to visit for a couple days. We had a great catch-up and even went down to the Museum of Science and Industry. Early this month, I saw “If Beale Street Could Talk” with James and Ellen. It helped me get positioned for the Oscar nominations. When the announcement was made, all my movie efforts for the last six months paid off. In the main categories (best picture, director, actor/actress, supporting actor/actress, screenplay and adaptation), I only have seven left to see. Two are in the theatre and I’m making plans to see them. The other five are streaming. I already knocked out “The Wife” (Glenn Close is awesome!) and “Ballad of Buster Scruggs” (A Coen Bros’ quirky and marring creation). I also thought I could scratch “Cold War” off my list but I realized I watched the wrong one yesterday. Dang! The Oscar chase is on with five more movies. With everyone’s January focus on eating healthy/drinking less/not spending money, I haven’t had pre-show dinners before plays. I did have preshow drinks with Tommy, Rick, Bill, Josh, James and Ellen. I had dinners with Collin, Steve & Mike, Bill, and Bill & Roger & Sue James. I also had a small bon voyage reception for Abby before she left for Los Angeles. And my last social outing was lunch with Bill before I boarded myself in to wait out the Polar Vortex. It’s February! I’m ready for a month of adventure. It’s 10 degrees now and it’ll be 50 on Monday! That will be -25 to 50 in less than a week. Nature constantly reminds us how life can completely change in a matter of days. The ice will always eventually thaw. I’m ready to get outside and see for myself.